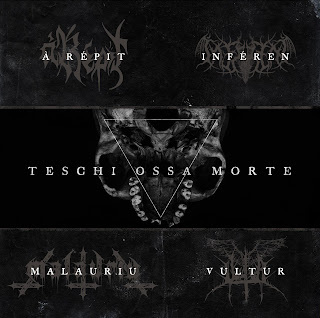 This is a review of a 4 way split album between A' Repit, Inferen, Malauriu and Vultur called "Teschi Ossa Morte" which will be released in March as a joint effort between Black Tears, The Triad Rec, Southern Hell Records, Ira Aeterna, Masked Dead Records, Nebelkorps and The Last Step and we will start off the review with A' Repit who return with their epic and atmospheric style of black metal. Their side of the split starts out with grim black metal screams before adding in some heavy riffing while the solos and leads are done in a very melodic style. All of the musical instruments on their side of the recording have a very powerful sound to them along with some clean vocals also being used briefly. At times the music gets very atmospheric sounding and when the music speeds up a decent amount of blast beats can also be heard. Acoustic guitars and flutes are also added on the second track. The production sounds very professional while the lyrics are written in Italian and cover History, Alpine Traditions and Legends. In my opinion this is another great sounding from A' Repit and if you are a fan of epic and atmospheric black metal, you should check out their side of the split. RECOMMENDED TRACK "Ventre di lupo". Next up is Inferen who return with their traditional style of black metal. Their side of the split starts out with a very heavy and melodic sound while the faster sections of the music also brings in a great amount of tremolo picking and blast beats which also gives the music more of a raw feeling. Vocals are mostly dark and grim sounding black metal screams. Throughout their side of the recording you can also hear a great mixture of slow, mid paced and fast parts. All of the musical instruments on their side of the recording have a very powerful sound to them as well as both of their tracks being very long and epic in length. The production sounds very raw and heavy while the lyrics are written in Italian and cover Apocalypse, Darkness, Evil, Visions and Doom Themes. In my opinion this is another great sounding recording from Inferen and if you are a fan of traditional black metal, you should check out their side of the split. RECOMMENDED TRACK "Volti di pietra". Next up is Malauriu who return with their raw and old school style of black metal. Their side of the split starts out with a very fast and raw sound which also uses a great amount of tremolo picking and blast beats. Vocals bring in a mixture of high pitched black metal screams and demonic growls along with the music being very heavily rooted in the mid 90's. At times the music also adds in a touch of war metal while the songs also add in a great mixture of slow, mid paced and fast parts as well as some synths also being added onto the second track briefly before returning back to a heavier style. The production sounds very raw and heavy while the lyrics cover death and human misery themes. In my opinion this is another great sounding recording from Malauri and if you are a fan of fast, raw and aggressive black metal, you should check out their side of the split. RECOMMENDED TRACK "Narcotic Cult. Closing this split is Vultur a band that plays an occult form of black metal. Their side of the split starts out with a very fast and raw sound which also uses a great amount of tremolo piking and blast beats. Their track is very long and epic in length along with the music also being very heavily rooted in the 90's style as well as the solos and leads being done in a very melodic style. Vocals are mostly angry sounding yet high pitched black metal screams while their song also brings in a great mixture of slow, mid paced and fast parts as well as all of the musical instruments having a very powerful sound to them and towards the end ritualistic soundscapes can also be heard briefly. 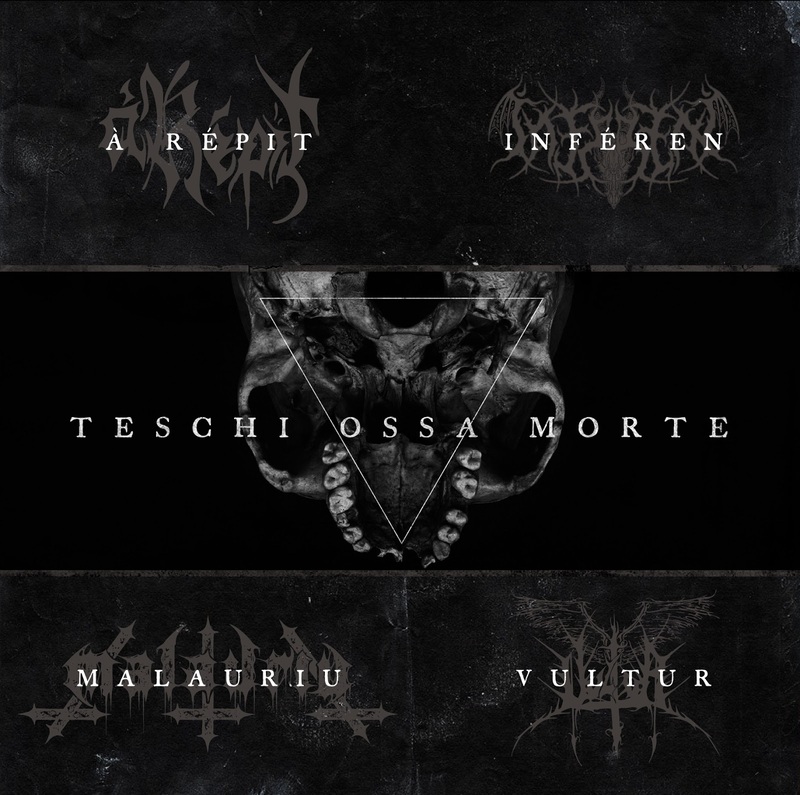 The production sounds very raw and heavy while the lyrics are written in Italian and cover Sardinian Occultism themes. In my opinion Vultur are a very great sounding fast, raw and melodic occult black metal band and if you are a fan of this musical genre, you should check out their side of t he split. In conclusion I feel this is a very great sounding split and I would recommend it to all fans of Italian black metal. 8 out of 10.